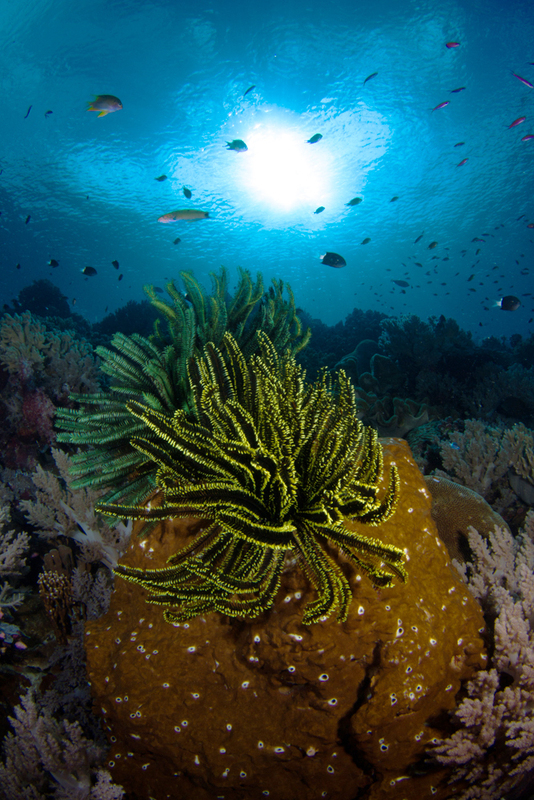 Ocean Safari Scuba | Blog | Plant or Animal? Bennett’s feather star (Oxycomanthus bennetti) is widespread in the Indo-West Pacific region. With the cluster of feather or fern like arms on a long stem, a crinoid looks like a flower, but it is not a plant. It is an echinoderm, related to brittle stars and sea urchins. The name “crinoid” derives from Greek word krinon, "a lily", and eidos, "form”. The feathery arms are used to trap detritus and plankton in the water. Please Note: This is a printout of the Ocean Safari Scuba | Blog | Plant or Animal? page from 04/21/2019. Some information may have been updated in the mean time. Please visit PAGE URL to view the latest up-to-date information or call us at 626-287-6283 if you have any questions.